The Second Baptist Church in Houston got more than 2,000 people together to bust some pretty weak moves for Christ over the Easter holiday. The "Dance Your Shoes Off!" event, captured in the video below (which has proved quite popular on YouTube), served two masters—God, obviously, and also charity. Each participant donated a new pair of shoes that missionaries will give to the needy. 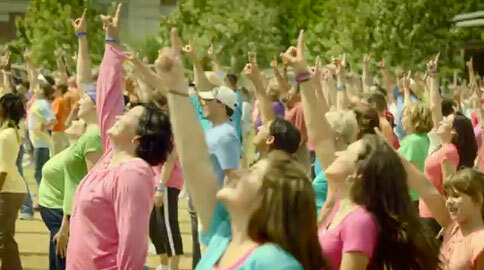 The song they're all doing light aerobics to is Lauren James Camey's "Rise Up." You can look it up on iTunes if you love Autotune as much as you love the Lord.